Using only best quality metal of high grade has enabled us to provide this range of highly qualitative range of Brass Nuts,Bolts and Washers. Made as per the standards of the industry, we have stringently fabricated this range at our warehouse in the most competent manners. 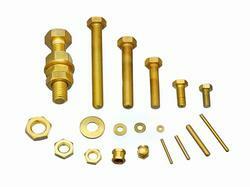 Customers are offered this range in a wide variety of specifications as per their needs and industrial requirements.